Piedmont Foot & Ankle Clinic is available to treat foot and ankle ailments such as diabetic foot care, ingrown toenails, fungal toenails, warts and painful calluses. 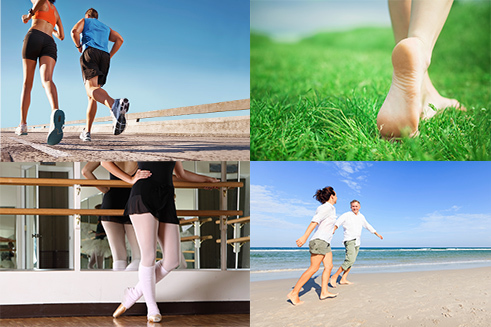 Our practice specializes in general foot care. Please call our office in Cary (919) 481-3338, Apex (919) 363-3310 or Dunn (910) 892-3338 for an appointment. Ankle sprains are very common injuries with more than 3 million suffered each year in the US. They occur when the ligaments in the ankle are severely stretched or torn. Medical attention will be necessary to rule out a fracture, as often it is difficult to tell the full extent of the injury. A bunion is a bone deformity usually occurring at the base of the big toe. This is a progressive condition that is made worse by inward pressure from tight shoes. Bunions can be very painful, and in some instances surgery may be necessary to remove them. Flat feet is a condition where the entire, or nearly entire, bottom of the foot meets the ground when standing. Depending on the severity, symptoms of flat feet can range from severe pain to non-existent. Hammertoe is a characterized by one or more of the toes having a bend in the middle joint. This occurs because of weakening of the muscle due to poorly fitted shoes or a genetically inherited trait. Diabetes is a systemic illness that can affect many different parts of the body. This is especially true for the feet. Proper foot screening is incredibly important for diabetic patients and any kind of cut or sore should be taken very seriously. A heel spur is a bony protrusion that occurs on the heel. It is often confused with plantar fasciitis, which is inflammation of the plantar fascia ligament. When a heel spur is painful it can make it quite difficult to walk. Corns and calluses are hard layers of skin that usually form due to friction. Generally, they will be in areas of the foot that are bearing weight, or areas that frequently rub against the shoe. Soft corns are typically found between the toes. Athlete’s foot is a very common fungal infection that affects countless people around the world. It will manifest itself on the skin of the foot, in many cases in between the toes. Because fungi proliferate in warm, damp environments, keeping the feet clean and dry is of utmost importance in avoiding athlete’s foot.